MEPs and stakeholders from the animal health industry gathered at the European Parliament this week to address key issues ahead of the UK’s exit from the European Union. The ‘Safeguarding animal health and welfare: a priority for the future UK-EU relationship’ event took place at the European Parliament in Brussels. Members of the European Parliament and the animal health industry gathered to discuss the key issues that must be addressed to enable a continuous supply of animal medicines in the EU-27 and the UK post-Brexit. 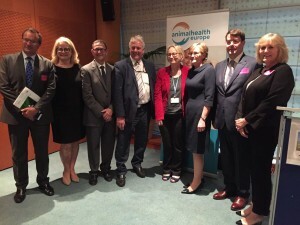 Facilitated by AnimalhealthEurope in conjunction with UK industry body, NOAH and Irish association, APHA, the event was co-hosted by MEPs Julie Girling and James Nicholson and was also attended by MEP Mairead McGuinness, vice president of the European Parliament. The panel speakers each addressed what they saw to be the main priorities for safeguarding animal health and welfare after the UK leaves the EU. Roxane Feller, secretary general at AnimalhealthEurope, said “Animal diseases do not recognise borders. Our ultimate goal is to ensure continuity of animal medicines availability for all veterinarians, farmers and pet owners throughout Europe to safeguard animal health and welfare. Pictured (left to right) are: George Tice, AnimalhealthEurope; Roxanne Feller, AnimalhealthEurope; Patrick Farrell, IFA national chairman animal health); MEP James Nicholson; MEP Julie Girling; MEP Mairead McGuinness; APHA’s John Keogh; and NOAH’s Dawn Howard.